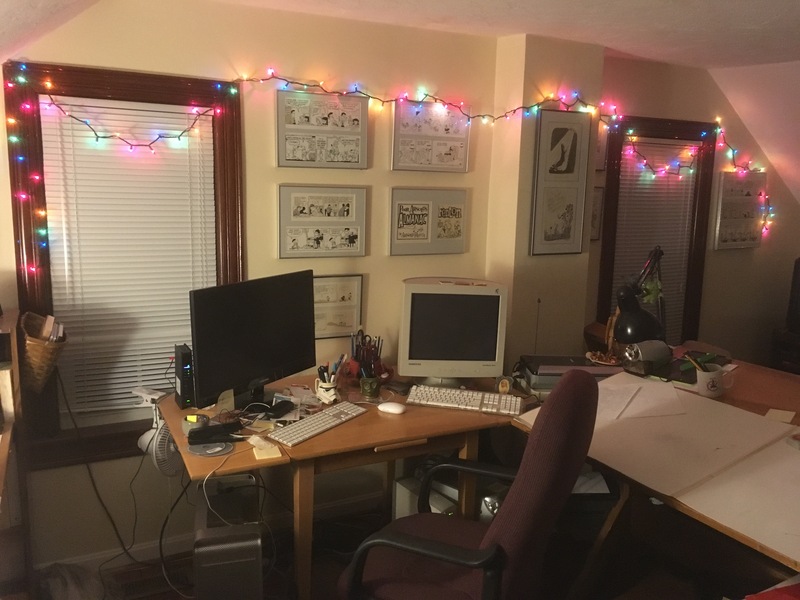 Fotographical Friday: Christmas lights in the studio never come down. 2. The boy loves cords. So even though I pushed all the computer stuff (Yes, I still have a tower) over under the desk, he is drawn to it like a fly to a pie. Possible solution: The small set of drawers I tried just didn’t block enough. I’ve taken a bamboo mat and have encircled the tech like a fence. Has not been field tested. 3. Sensing his father’s addiction to TV, the boy is fascinated with the DVD player and VCR. (Yes, I still have a VCR. Two, as a matter of fact.) Possible solution: I bought a wire mesh self thingy at Target, turned it on its side and put it in front of the “fun.” I can still use a remote through it, but tis true that little fingers could do the same. Has not been field tested. As I mentioned back here I had a lot of work left to do it get my studio in shape for a small, crawling boy to be small and crawling in it. I took chunks of the last three days to finish it up. Our large garbage can is completely full, as are the recycling bins. The shredder died then came back to life. (It wasn’t actually dead, just sleeping cuz it was over-heated.) 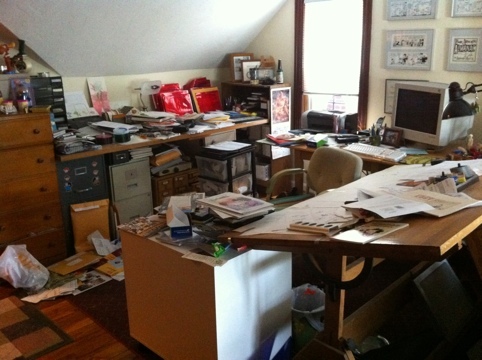 And my head nearly deflated as I tried to figured out the old financial statements that had piled up on the floor. But the traveling is hard. The reason that my blogging has been so sporatic in the last couple of weeks is that I been on the road – two weeks straight, three different states, cross-country, planes, trains and automobiles…and a ferry. I had a couple of posts scheduled, but it hardly filled the maw of the blog. I’ve actually been home for a week, trying to catch up and do things like get my studio in some sort of shape so my kid can crawl around in it. It’s the only place left in the house that is not kid-proof. 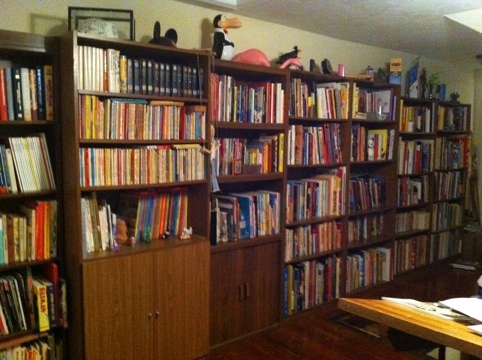 The plan revolved around leaving the bottom one or two shelves empty. My wife suggested leaving books there but jamming them in tight enough that the boy would be foiled in his de-booking attempts. Great idea. Saved me some trouble. But I spent six hours on this task and it looks like I did nothing. And it’s not like the studio is finished. Take a look at the pic below. That’s the other side of the studio, where the paper cutter is conveniently at child-height. The newest member of my family – Alex! Oh, you may have thought I was talking about my-yet-to-born child. 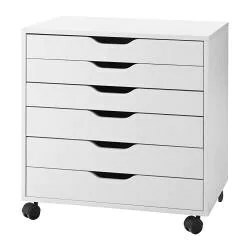 Nope, I’m talking about the storage unit the style of which the fine folks at Ikea have named Alex. We were indeed in the land of the Swedes to shop for the house, and much of that revolving around the above mentioned kid, when I saw it. But it wasn’t until I called over my wife to look at it did I realize how well it would work for my studio. My problem is not having enough flat space for all the projects I’ve got going at any one time. Will it work? Don’t know yet. It’s still in a box waiting for a wrench named Allen. 1 Various finger puppets from my wife. 2 Platypus wind-up toy, tin can car, worry dolls and bobble head turtle also from my wife. 3 Packet of Vegemite from the late, great Australian cartoonist James Kemsley. 5 Fountain pen from late, great cartoonist Ford Button. 6 “Can Chasers” toy. Two cars are held onto the “road” by magnets and when you turn it on, they chase each other around the can forever. 8 Sammy Davis Jr. poker chip that made my friend illustrator Chuck Gamble almost miss his plane in Vegas to get for me. 9 A name license plate from my youth. 10 A wooden cloud that was part of some sort of nursery rhyme scenario that hung on my wall as a child. 12 French Curious George key chain and Japanese Elmo chopstick rest. 13 Artomat patch. My wife and I did pieces for them. The concept is cool beyond belief. You gotta check them out. 15 A figure sent to me by Chuck Gamble that might just be the title character from the song “Who The Hell Is Mrs. Valdez?” by the “scariest band in the world”, Deadbolt. 16 A couple noise-making thingies. 19 Woodpecker toy from Prague. It vibrates its way from the top of the “tree” to the bottom. More “wacky stuff” in my studio. From left to right: An original cartoon from my friend, the late, great Ford Button (his wife gave me it as a wedding gift), an old magazine ad with three comic strip guys – Al Capp (Lil Abner), Milt Caniff (Steve Canyon) and Walt Kelly (Pogo) – pimping Sheaffer fountain pens (from my friend Sue), a mug with a Ford cartoon holding a bunch of his pens, a tin of Tuxedo Crabmeat*, a tiki man from my friend Chuck (a tribute to our favorite band, Deadbolt)**, an original oil painting…from the Dollar Store***, a shellaced piece of coal from the Pennsylvanian mines my grandfather worked in, a bottle of beer with a label done by Dave Covery of Speed Bump fame. On the side of the bookcase you can see part of calendar from a local Mexican store. The illustration looks like it’s from an Aztec-y romance novel. * This was a famous item I had in my cubicle at my last job. The label has a great cartoon of a crab in a tuxedo with monocle on one of his eye stalks. The other reason I had it is because it was from the Dollar Store…and the concept of buying seafood at a discount store was just fascinating. ** He bought it in Hawaii…in a Walmart, because he couldn’t find a “real” one in a more “authentic” store. He had to glue on the eyes himself. I have a number of cratoony-ish figures in my studio. Both of these are from other countries and both protect my monitor and the 50s white, metal kitchen cart it sits on. A clay golem bought at souvenir stand outside the Jewish Museum in Prague…. …and this weird platypus/brainiac creature that I picked out for my birthday present in a little pottery shop out in the country in Paraguay. What do I have on my drawing table besides work? Glad you asked. From left to right: flexible wooden snake, paperweight from Syracuse University, playing cards – DC/MAD and pulp magazine covers, a Paraguayan beer coaster (its logo looks like a thought balloon), a hockey puck from the rink that Charles Schulz build in Santa Rosa, CA, a wooden chicken toy from Prague (hold it by the handle, move it in a circular motion and the chickens peck – hours of fun), mom’s old tea cup that I put my ink bottle so it won’t tip, an ancient clip thing that was in my dad’s desk when I was a kid. Oh yes, and Christmas lights, cuz they’re festive. 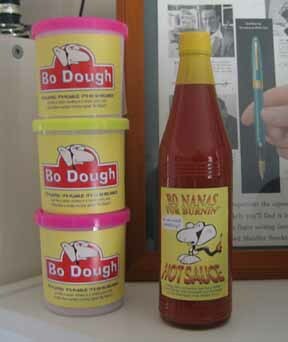 I’ve written about fake Bo Nanas merchandise before. Come Christmas time I start haunting discount stores looking for cheap products I can relabel and send to clients. Now they sit in a weird little shrine in my studio. This camera actually works. It has no motorized mechanics (which is why it was so cheap) – it’s just a box with a hole. Like a plastic Brownie.